Osteoporosis is defined as the loss of mass and density of the bones in your body, which makes them more susceptible to fractures. 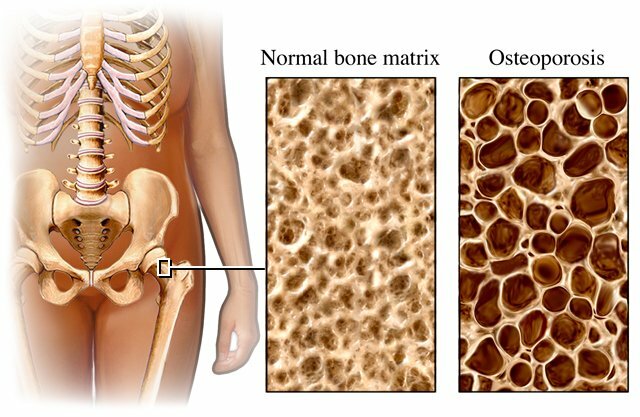 If you look below at the first picture you can see the difference in the density of the bone between a normal bone and one effected by osteoporosis. If the bones in your spine become weak and spongy, your spine gradually compresses or shortens. People with advanced osteoporosis sometimes take on a hunchback shape as a result of this spinal compression. As you can see in the second picture the spinal compression puts more pressure on the abdominal cavity where organs are stored as well as more pressure on the spinal discs. This increase in pressure can result in nerves that exit the spine becoming compressed and causing pain and other problems. Additionally, the spinal compression affects internal organs due to the decreased space in the abdominal cavity and pressure on the organs. Over time this can lead to problems such as digestive disorders from abnormal pressure on the intestines. Osteoporosis is often thought to be caused by a deficiency of calcium in the body, but in fact it is usually an issue of improper use of calcium along with other factors including hormone imbalance, systemic inflamation or acidosis, and vitamin D deficiency. Magnesium is actually what regulates calcium use in the body because it activates three major hormones used in calcium metabolism: parathyroid hormone, vitamin D, and calcitonin. Through these interactions magnesium is actually more important in the production of new healthy bone then calcium. Also taking calcium supplements from a synthetic or non-food source might not be doing you any good. When I say food sources of calcium I am not refering to milk or dairy products, which can actually cause more problems and is not easily absorbed. (See Dietary Guidelines for more information about the dangers of dairy). Supplemnts that come from natural sources or calcium you get from real food is absorbed much better and will provide superior benefits to your body (See chart below of food sources of calcium). Smoking and alcohol consumption both been shown to interfere with calcium absorption as well. Other factors, such as stress, diabetes, menopause, lack of exercise, and even overuse of laxatives, have been associated with osteoporosis. A very common cause of osteoporosis in today's society is systemic acidosis, which means peoples tissues are excessively acidic. This is usually caused by a diet high in sugar, processed food, fried foods, trans fat, and low in alkaline foods such as certain fruits and vegetables as well as clean water. For more information about food pH please see the link (Chart of alkaline foods). Another culprit is actually calcium supplementation. Calcium is pro-inflamatory and needs to be balanced with magnesium which is anti-imflamatory, so make sure you are getting enough magnesium if you are taking calcium supplements. The body works hard to keep itself from becoming overly acidic by "buffering" its systems like blood and extra/intracellular fluids. The molecule bicarbonate is used throughout the body to neutralize the acidic chemical compounds. Bone is a very easily accessible source of this bicarbonate and when the body takes it from the bone it causes the hydroxyapatite crystals, which are what make up bone, to dissolve. This process is slow, but over time can reduce bone mass and density. 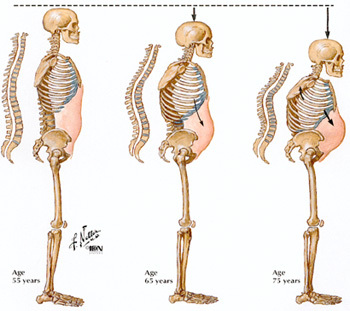 With the diet patterns of Americans today this could be why we see higher rates of osteoporosis later in life. Another common cause of osteoporosis is a lack of physical weight-bearing exercise. Excercise is important because it causes microtrauma to the bones and stimulates bone regeneration and strengthening. It is important to not only excercise, but also do resistance training and improve your flexibility. Things like bike riding, swimming, or other sports where you are supported by something other then your feet and legs aren't considered weight-bearing exercise. Weight-Bearing Exercise: walking, hiking, jogging, stair climbing, dancing, sports, anything that you are on your feet not in water. Flexibility: it is important to stretch regularly and to make sure you always balance your stretching to keep your joints properly supported. Estrogen levels in women are linked with the development and severity of osteoporosis. Estrogen is thought to be involved in regulating osteoclastic activity (osteoclasts are cells that break down bone) by blocking their production and possibly inducing cell death as well. So increased levels of estrogen result in less osteoclastic activity, which means less bone breakdown. Women who smoke are at a significantly higher risk of having osteoporosis than any other demographic because long-term smoking causes a decrease in the body's estrogen levels. Also there are higher levels of osteoporosis in post menopausal women as well due to the lower estrogen levels. There are many natural ways to increase and balance estrogen levels instead of using hormone replacement therapy and if you are interested just ask one of the doctors here at Synergy Chiropractic about what option might be best for you. A 2008 article in the journal Cell Cycle talks about possible mechanisms for estrogens regulation of osteoclastic activity. "Unraveling Estrogen Action in Osteoporosis." Study of importance of magnesium Dalderup LM: The role of magnesium in osteoporosis and idiopathic hypercalcaemia. Voeding 21:424, 1960.